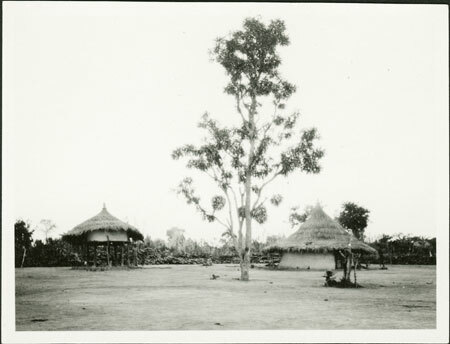 A view of a homestead, including a raised granary (gbamu), a sleeping hut with clay wall (gbuguru) and to the right of the tree the household's tuka or spirit shrine, where offerings are made to ancestral spirits to ensure the welfare of the inhabitants. Medicines can be seen growing near its base, plants such as ranga ambiri (against wild animals) and sarawa (food-medicine) are frequently sited there. In The Azande (OUP 1971, page 91) E. E. Evans-Pritchard notes that '[e]very Zande householder today has a granary with a movable roof, called gbamu, for storing his Eleusine...This type of granary is said to have been borrowed, though a very long time ago, like the culture of eleusine itself, from the Amiangba.' In The Azande (OUP, 1971) page 99, E. E. Evans-Pritchard notes that "the ordinary old Mbomu shrine is the tuka, a stake split at the top and with the split sections bound to form a recepticle for offerings." In Witchcraft, Oracles and Magic Among the Azande (OUP 1937, page 441) he also states that 'Medicines which are domesticated are planted around the ghost-shrine, and when a new shrine is erected medicines are often buried at its base and ghosts and medicines are alike addressed to ensure the welfare of the inmates of the homestead. Morton, Chris. "Zande homestead " Southern Sudan Project (in development). 03 Jan. 2006. Pitt Rivers Museum. <http://southernsudan.prm.ox.ac.uk/details/1998.341.344.3/>.